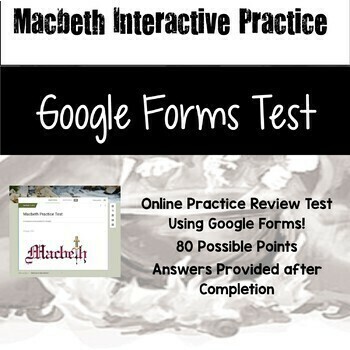 This online review test will allow students to go through 80 questions for Macbeth using Google Forms. 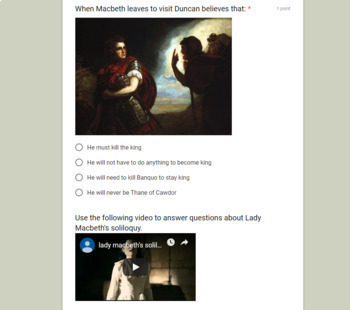 Students can access this test using the QR code and use their phones or they can use the web address and access it using a computer. 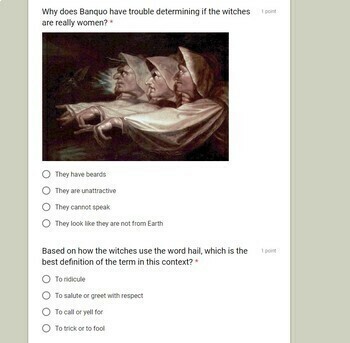 After finishing the practice test they will have access to the correct answers. Students can take the test as many times as they want to prepare for the test. My students LOVE this activity and they feel as though it prepares them for the real test. The test is interactive. Many questions have pictures or videos to help with understanding. 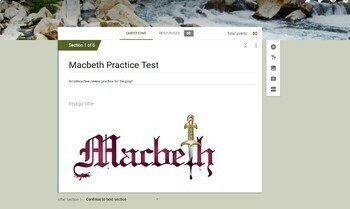 You will receive a word document with a link to the google form to share with your students and a QR code to share with students is you want them to use their phones. The quiz has 80 questions. If you want to gain access to your student's answers, I will e-mail you a copy of the form. You can give me your e-mail by asking a question about the resource.